Hyundai Santro 2018 car maker Hyundai launches Hatchback Car Santro in a new avatar on October 23 in an event organized in Delhi. Everything has changed in addition to the name in the new Santro. A lot of people were waiting for the arrival of more Spicy Santro than before. Bookings from the company started on October 10. Bookings of 23,500 units in 12 days showed that the car is getting tremendous response to customers. 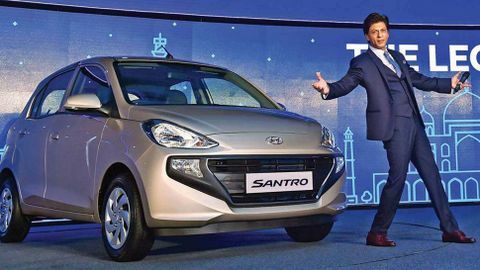 Prior to launch, the new Santro remains in the headlines is special in many ways from the old car. If you are planning to take a new Santro then you have a good chance. Earlier, the company had fixed the amount of Rs 11,100 for its booking. This offer is still being offered by the company. Customers who make initial 50 thousand bookings will have to deposit 11,100 rupees for booking. If you book online car with HDFC Bank debit or credit card, then it will get 10 percent cashback. That is, you have to pay a total of Rs 10,100. So what can you do by booking a new centrally and quadruple the happiness of the upcoming Diwali? Online booking can be done from the company's website till November 30. Let me tell you one more thing at the hands of the HDFC Bank cashback offer only when you take an auto loan from HDFC. The new santro has a 1.1 liter petrol engine; it also has the option of CNG. The new Santro has also been given the option of automatic. The length and width of the new Santro is also more than before, which makes it look more strong than ever. The car has a touchscreen input system of 17.64 centimeters. Apart from this, Apple Car Play, Android Auto Factors will also be available. The new Santro also has a rear AC vent. All Variants of the car have been given ABS and Driver Air bags. Petrol engine has power of 69 PS at 5500 rpm. The power of the CNG engine is at 59 ps. The company claims 5 speed manual transmission and AMT version of 20.3 km per liter mileage. The car's CNG variant will mileage 30.48 km / kg. The car is launched in 5 variants, Delight, ERA, Magna, Sports and ASTA variants.